Happiness is a warm fireplace. The new brickwork still needs painting, but you get the idea. I’m a slow writer. Even when I’m well-rested, well-fed, well-caffeinated, focused, comfortable, with good light, and have an idea I can pursue, I’m unlikely to hit 1,000 words a day. My goal is 500. Usually I hit that. Some days I hit a little more. Some days, I regret to say, I hit less. Despite the slowness of my pace, despite the “thought” and “care” I can theoretically put into my daily output given the time I put into it, on any given day I’ll delete half of what I wrote the previous day. And sometimes—fairly often, really—things snarl up anyway. Just two weeks ago, I reported that I’d hit a wall with my WIP. I needed to work out the story question. That question answered, the “wall” that I saw two weeks ago is now just a distant memory, something that turned out to be merely a bump in my writing road, a problem solved quickly and almost painlessly. In fact, lately I’ve been—for me—streaking along. I’m writing 600 or 700 words a day most days, and I don’t delete that much from day to day. Every day I have an idea. Every day I can express it. This is just about a miracle. Why? I wondered. What have I done, what has happened? And how can replicate it? I’ve given this question some thought over the last few days, and I think I know the answer. It’s my new fireplace. Here’s the backstory: I live in northern California, in a 110-year-old, uninsulated duplex. It doesn’t snow here, but in the winter, the overnight temperatures fall into the forties usually, and sometimes the thirties. My apartment originally relied on the coal-burning fireplace for heat. Then about forty years ago, the place got a wall heater, which did not heat the apartment adequately. The coal-burning—and then wood-burning—fireplace was abandoned as too dirty. Over the years, I tried to find ways to stay warm in this apartment, and I was never fully successful. I added space heaters. I wore sweaters and wrapped up in shawls—indeed, friends said that at times I looked like a Bedouin nomad. And yet, I was never quite as warm as I would have liked to have been. I was always getting under a blanket. My fingers were always cold. Until this year, when I had a gas insert installed in the fireplace. It has transformed my life. For the first time in decades, I’m warm enough every single day. Some nights when I’m in the living room, the farthest I can be from the fireplace, I’m too warm. I’ve never been too warm in here. The fireplace has a thermostat, and I can control the temperature, the speed of the fan, and the height of the flame. It looks good, and best of all, it feels really, really good. You have no idea how cheery this fireplace makes me. And how much comfort the heat has added to the quality of my life. I revel in the warmth. I love the new fireplace. Is my new, warmer atmosphere responsible for my increased productivity and improved writing? I don’t know. But I’m sure not turning off the fireplace to find out. What about you? Does physical comfort—especially heat—help your writing? Or does lack of it freeze your imagination? This entry was posted in Writing Life and tagged Kay Keppler, writing. Bookmark the permalink. LOL. Oh my goodness. The cold freezes my brain. The heat makes my mind melt. Rain is pretty good, and snow is nice if I’m inside and warm. So basically, I need to be rested, fed (but not too fed), well-lit, dressed and without cats — and in the proper temperature range! I’m so glad you’ve found the secret to success (-:. We’ve all been looking for it! And that is a beautiful fireplace, and it looks so nice and cozy. Maybe some of the goody can be transmitted over the internet (-:. That fireplace is beautiful. My own fireplace hasn’t been used in decades, since there is a crack in it somewhere and I’m worried about burning the house down; not to mention all of the spare-the-air days. I definitely need to be comfortable when I write and am often wrapped up in quilts and afghans on chilly days. I can’t do that at work though and often wind up with icy hands when I’ve been at the computer for a long time. I don’t know if I write better or worse when I am uncomfortable, but it definitely makes me cranky. I know exactly how you feel. I’d had a lot of years of being just somewhat too cold, and I probably would still be too cold if the wall heater hadn’t decided to die (again) this year. I’ve had it repaired a few times since I’ve lived here, but this time when I called all my standard repair places, they said the manufacturer had gone out of business and they didn’t make parts any more for something this old. So it was either install a new wall heater or install the fireplace. I’ve always liked a fireplace, so I decided to take the plunge. And a gas insert gets you past the spare-the-air days. And now, I’m so happy that I went this way. Plus, toasty. My magic formula appears to be a good night’s rest, an hour of exercise, including 30 minutes of walking outdoors, alone, a shower and breakfast. Also, a story where I know who the characters are and what they want and what it is about them that gets in the way of that. Also, LOVE the fireplace. When we moved here, the one in our living room, which was the sole source of heat when the house was built 95 years ago, had the tiniest opening? grate? not sure what it’s called—in the history of the world. We had someone open it up, but it’s still too small to readily accommodate the gas logs I’d like to install. It’s been a tough winter in Ohio. We may have to move “fixing the fireplace” higher on our list. I think those tiny openings meant that the original owners burned coal. That’s what I’ve been told, anyway. My opening was in the shape of a mushroom, and the bottom “stem” part was only13 inches wide. So brick guys had to come and cut away the bottom and square off the top, which is why you see all the unpainted bricks in the photo. This fireplace really throws off a lot of heat. I bet you wouldn’t be sorry if you made it happen. That sounds like a formula for success for just about anything you’d want to do! You’re certainly zipping along with your projects, so I’d say it’s working well for you. I’ve been having a similar creative burst, and I realize those happen when I am doing well mentally, which often looks like me finally calming down enough to get my expectations out of my way and just write what’s on my mind without freaking out about the final product. Oh, my gosh, yes. Enjoying the process is its own reward, really, right? If you’re panicking about how you’ll make the ends tie up or the tone that you’ll be setting or are fretting that whatever you’re doing isn’t good enough, it’s really hard to get into what you’re doing and just move forward, making everything the best you can do right now. Congratulations on your creative burst! Those are always fun. I love the fireplace. I think it looks kinda funky with the red and painted brick. 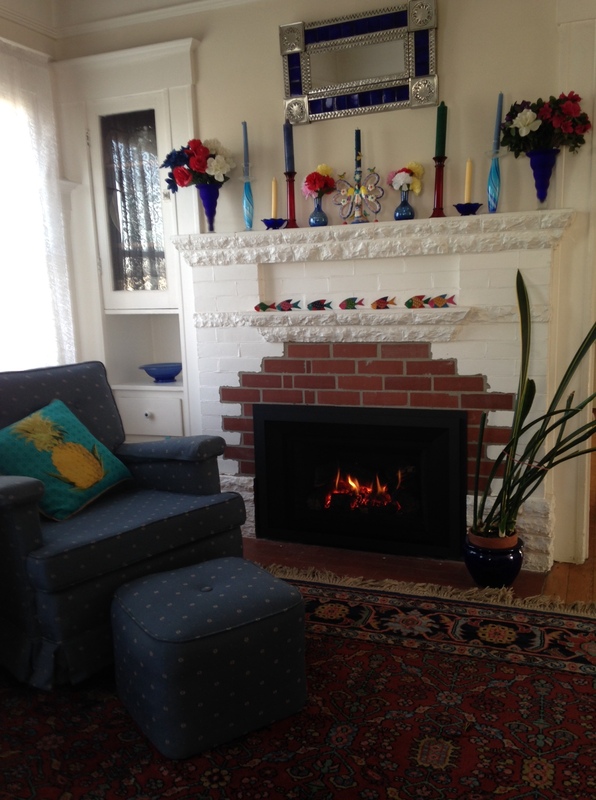 We love our fireplace and use it all the time. It is a catalytic wood burner. I have to be comfortable, and do better in the morning. In the evening, my brain is too tired. I’m shot by nightfall, too. And I’m finding that at least right now, the added comfort of the extra heat seems to be really fueling my creativity. A catalytic wood burner. That sounds like that would keep a person toasty, too! I love the look of that whole room, Kay! It looks like the fantasy room in my imaginary next house, which will be in a very walkable/bike-able city, where I can burrow in like a hermit most of the time, but find lots of fun and artsy things to do when the mood strikes me. And I envision cats stretched out in front of the flames, and a wall of built-in bookshelves across from that cozy chair where I’m sitting, sipping Bourbon and writing a masterpiece…Heck, I think your new fireplace is even inspiring me!